"While planning my wedding, I had to deal with seven different vendors. Without a doubt, Vish was the easiest to work with! She patiently answered all my questions, took real interest in developing the ideas I had imagined, kept each and every commitment she made and finally delivered a fabulous product. She turned my over 400 photos into something too beautiful to express in words. 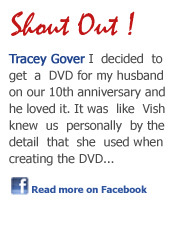 Keep up the good work Vish- you rock!!" This is a small clip from a Slideshow I created for Lisa & Jason's wedding rehearsal dinner. They played the photo montage on a big screen during the event and it was such a huge hit. After the show, the guests gave a standing ovation to the beautiful couple who were on their way to starting a wonderful life together! On their first anniversary, Holly wanted to gift her husband something special that they could cherish forever. So she asked me to turn their wedding pictures into a Slideshow that would let them experience those beautiful moments once again. Watch this short preview of the DVD- and remember to smell the roses! Robert and Helen were going to celebrate their golden wedding anniversary, and their daughter decided to surprise them with a very special gift- a photomontage depicting their wonderful love-story! So she and her siblings secretly got photos from the family album and sent them over to me with a list of music their parents loved. They were so impressed when they saw the Slideshow! Enjoy this preview. Rose had no idea what birthday present to get for her husband- cologne, wristwatch or hi tech gadgets just don't seem romantic enough! She decided to gift him a Slideshow, custom made with their pictures. Her husband was so delighted- they have moist eyes every time they watch it! See this clip from her video. Justin's mom wanted to do something unique for his 1st birthday. She decided to play a Slideshow at the party. Later, she told me how thrilled her guests were by the show, even the restaurant manager gave her compliments for the idea- he had never seen anything like that before! Here's a sneak peek at the video. Megan was going to turn 16 and she planned a dream birthday party that would be remembered forever. She and her parents sent me pictures from her childhood and growing-up years to create a musical video montage that tells her story in the most spectacular way! Enjoy this clip from her Sweet 16 DVD. Graduating from high school was a huge milestone for Brennan and he wanted something special to celebrate the achievement. He and his parents sent me pictures from his childhood through teens to get an exciting Slideshow made for the party. Everyone was so proud of the new graduate in the family! Caleb wanted to celebrate his Bar Mitzvah in style, while also preserving the traditional spirit of this very special day. So he and his parents asked me to create a unique Slideshow that tells his whole story - his birth, school graduation, his team's victory at the game and more. Mazel Tov, Caleb! When Jenny’s mother passed away, she contacted me to make a slideshow honoring her mother’s life and achievements. She sent me pictures from her mother’s childhood, her married life and her later years with the grandchildren. The photomontage DVD was played at the funeral and appreciated by all friends and family. Bubba's favorite activities were to play fetch at the beach and to lick snow outside. He was an amazing dog and baby to Hal and Jen. His passing left huge sadness in their hearts and they wanted a fitting memorial for their most beloved pet. They sent me his pictures and videos. Here is a sample from Bubba's Slideshow. The Lakeshore United Methodist Assembly found me while looking for a powerpoint slideshow maker. They needed a DVD to play at their fundraising dinners for showcasing their extensive community work. The Slideshow was made with pictures of their facilities, workshops and events they organized. Donors were truly touched by the video presentation! During the holidays, Heather wanted a unique personalized gift for her family and friends. She realized she had so many beautiful pictures of her kids, with which she could get a very special musical Slideshow DVD made for everyone. What a touching way to wish your loved ones Merry Christmas and a Happy New Year! Do you need a Slideshow for an event not listed here? Please contact me and I’ll be happy to create a DVD custom made for you! I also make shows for Quinceaneras, Bat Mitzvahs, Bridal Showers, Retirements, Reunions, Farewells, Corporate Parties, Sports Teams & more- I do special requests all the time! "My wife's birthday was barely a week away and I really wanted to do something different for her this year and then I discovered your website. Luckily I did have a bunch of pictures from our dating and honeymoon days, with which you made the wonderful gift for her. My wife was totally knocked off her feet when I surprised her with the musical DVD- I don't think she was expecting anything more than the usual chocolates and roses from me! She was sooooo touched- can't thank you enough, Smiling Snaps!!"